Deputy Transportation Minister says it's time to “change the rules” following the murder of the three Israeli youths. Deputy Transportation Minister Tzipi Hotovely (Likud Beytenu) on Tuesday said it was time to “change the rules of the game” following the murder of the three Israeli teenagers by Hamas terrorists. 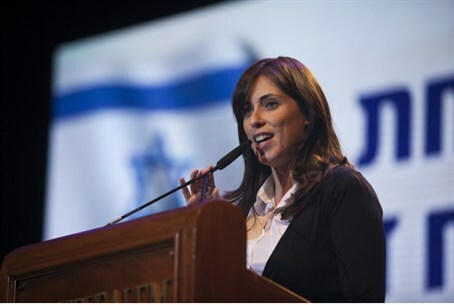 Speaking to Arutz Sheva, Hotovely said that increased construction in Judea and Samaria and targeted killings of terrorists were no longer sufficient as responses, adding that it was time to impose a death penalty on terrorists. "This is the first incident to come out of Judea and Samaria after the Hamas and Fatah unity. It cost the lives of three innocent boys who wanted to return home safely. The government must now think about a long-term strategic move that will restore the deterrence,” she said. Hotovely's reference to Nazis was a reference to the trial and execution of Adolf Eichmann, one of the architects of the holocaust who was the only person to have received the death penalty - which does technically exist, but is never actually implemented - in Israel. "It’s time to change the rules of the game and annex all the Jewish communities," she added. On Tuesday evening, the Security Cabinet met in Tel Aviv to discuss what response Israel is to take in response to the murder of the three youths. This topic already raised serious debate in a similar meeting on Monday night, in which leftist ministers opposed expanding Israel's operations. Speaking before Tuesday evening’s meeting, Prime Minister Binyamin Netanyahu said, “We have three tasks: First, to reach the murderers and all those who participated in the kidnapping. Whoever was involved in the kidnapping and the murder will bear the consequences. We will neither rest nor slacken until we reach the last of them and it does not matter where they will try to hide. We will reach them all even if it takes time. This is our first goal and it will be carried out. “Second, we must vigorously strike at Hamas members and infrastructures in Judea and Samaria. We have already arrested hundreds of Hamas activists. We have closed dozens of institutions. We have demolished homes. We are still active. “Third, is that we must act against Hamas in the Gaza Strip. Hamas is continuing to encourage the abduction of our citizens and it is directly responsible for firing rockets and mortars at our territory, including in the past few hours. The IDF has been active in recent days against Hamas targets in the Gaza Strip and here as well we are still active. If need be, we will expand the campaign. “Anyone who thinks that they can achieve anything by using terrorism against us will continue to be mistaken and will achieve the opposite results. Hamas is responsible. Hamas will pay and Hamas will continue to pay. We are acting with determination, sagacity and responsibility with the top consideration – of myself, the Defense Minister and the Chief-of-Staff – being to ensure the security of Israel's citizens," Netanyahu stressed.